A great story which anyone who's been there will laugh at and say, “Yeah, that's me!” And the 31 Phrases only people in the military will understand is also great. 5,7,8,10,12 and 13 for sure. The two most common reactions? They stop listening about halfway through the list, or they sit there with a shocked look on their face as if there's something wrong with me, and then say, "No, I mean, where were you born?" as if that indicates "where I'm from". I'm not "from" anywhere. I do not get any other reaction. Now I just say, "I was a military brat...all over." If they insist on knowing, it's their own fault it's going to take some time. Good article, enjoyable. Thanks for sharing. This should probably go under the JOKE thread but will quote it here for a good laugh by many. A retired Marine Gunny (Army Mstr Sgt)(your choice) has a morning bed inspection for his three young boys. The three boys ages 7,5 and three are standing at attention next to their beds. The dad comes up to the 7 yr old and says...."soldier, your hair is a mess and your shirt is unbuttoned that means NO DESERT at evening mess and restriction to your bedroom". The dad next comes to the 5 yr old and says...."soldier, you forgot to make up your bunk, clothes are on the floor, shirt is unbuttoned, shoes are NOT shined, your a disgrace. For that you are restricted to your bedroom, NO TV, NO I Pod, one week w/o any evening mess desert"
He next comes to the 3 yr old and shakes his head in disbelieve and says....."soldier, I cannot believe the sad shape you and your bed are in......words are just not there for a description of your problem....you are restricted with the same punishment as your older brothers and in addition will have to clean the latrine for a week.....what have you got to say for yourself son? 3 yr old salutes and says...." Sir. how does a man get out of this Chicken S*** outfit"? I was just a teenager when my brother joined the Marine Corps. I just knew back then that having a Marine brother earned me some MAJOR bragging right among my peers. I really enjoyed it ! Yes, I absolutely DO have automatic respect towards men and women in uniform. And I kind of understand "“15 minutes prior to 15 minutes prior”. Matter of fact, our family still makes fun of my big brother because his clock and watches always set to be 15 minutes ahead. He has been out of the Corps for 12 years now, and this is something has never changed for him. You reminded me of an incident when I was in the military. 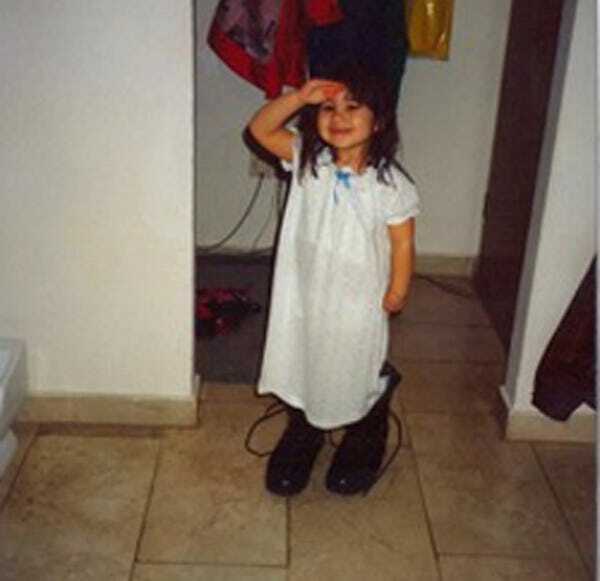 After being a military brat for so long, I knew how to clean a room. You want "white glove" treatment? Then go live at my parents house. The house was spotless. In fact, when I returned from Germany to visit them before going on with life, I was blinded by the kitchen floor because it was so clean, waxed, and bright. I lived like that every day. Everything in its place, everything perfectly clean. I used to joke to my friends, as a kid, that I should just put up a velvet rope and charge admission because our house was cleaner than a museum. Anyway, one day, the brass was coming to inspect. He would inspect our barracks rooms, our uniforms, and then monitor while we ran a 2 mile run. He went from room to room to room, and not one person passed. He got to my room. He tried, he tried so hard to find fault with my room. My room was the only one that passed. He asked me how it was that my room was spotless and he could not find a single deficiency. I simply replied, "Sir, I just told myself that if my mother would pass this room, then I know the Lt. Col. will". He laughed long and hard at that, and I became one of his "favorite" soldiers from that point on. I guess so many years of "training" how to keep a place spotless, finally paid off. Number 5 stuck with me. I did it my whole working career. And I wasn't an Army brat, just did my three and out. Naval air that I was in, did not even use those words, and they really were not understandable to us. Our naval air transport squadrons were almost a different life. I was the air terminal chief, in charge of all passengers, cargo, and preparing the planes for the passengers and cargo. I'm not a military brat, but I am a military spouse, and #5 is so true. Real life conversation between my husband and myself at Christmastime at a new duty station (names/ratings changed for privacy's sake). Husband: I think we should have [petty officers who work under me] over for a holiday get-together. Me: Cool, I'll do a couple of kinds of chili, people can bring sides or desserts. How many are coming? Husband: Well, let's see, there's Foster and her husband, Buckley and his wife, McKay and his wife might bring their two girls, and I think Nichols' girlfriend is town, so she'll probably bring her. Me: Okay, I've met Nichols, Buckley, and McKay, right? I don't think I know Foster, though..what's her first name? Check out these military kids. Turn the volume up a little and you can hear what they are responding to.